Coelho’s Body Repair & Auto Sales, Inc.
Snehal Shah is owner of Auto Techies. Nobody expects to have a car accident. They’re certainly stressful enough without having to worry about finding an auto collision repair shop that you can trust. But if you’ve been involved in an accident, you need just that—a good auto body repair shop that will make your car, truck or mini-van look like new again and restore it to pre-accident condition. 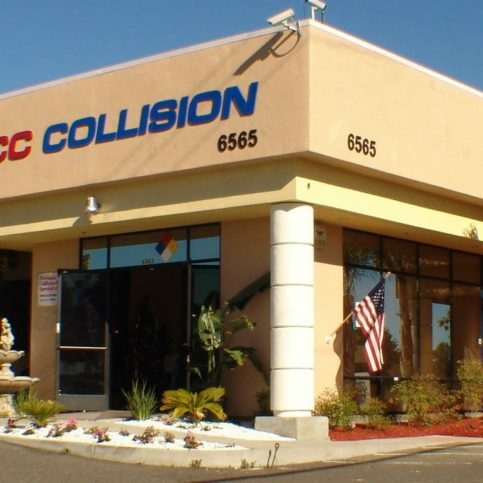 There are many car collision shops in Alameda County from which to choose, including those that serve the major cities of Oakland, Hayward, Fremont, Berkeley and San Leandro, as well as all the smaller Tri-Valley towns. 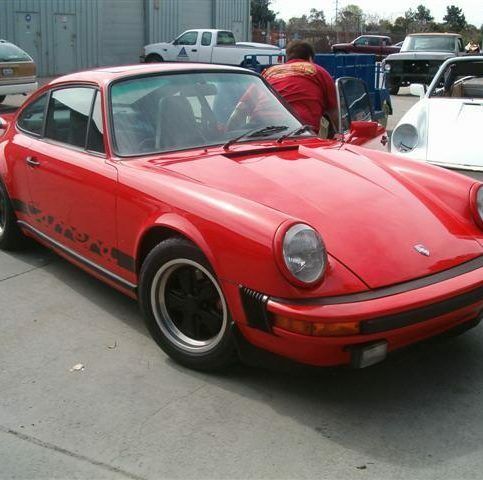 Choosing an auto collision repair shop is a mystery for most people. 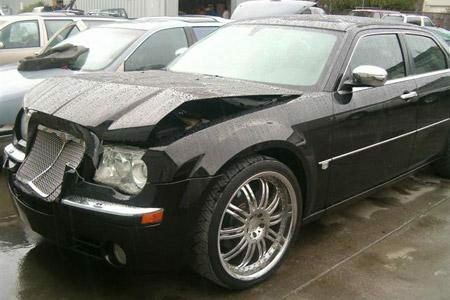 It’s obvious when the paint is new and the dents are gone, but how do you find a body shop that will do it right? One you can trust to straighten the frame, install a new windshield and apply new auto paint—and everything in between? Information is the key. The more knowledge you have, the more confident you will be in making an informed decision. 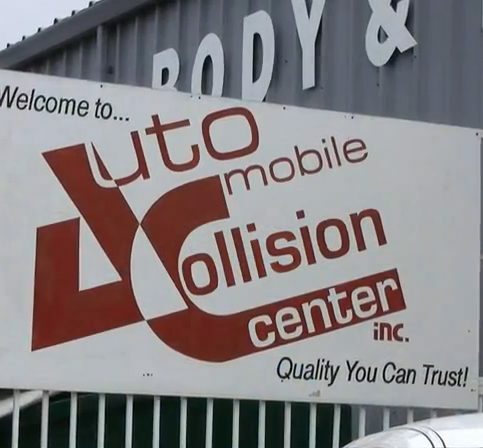 But where should you begin, in the sea of auto body repair shops in the North Bay? 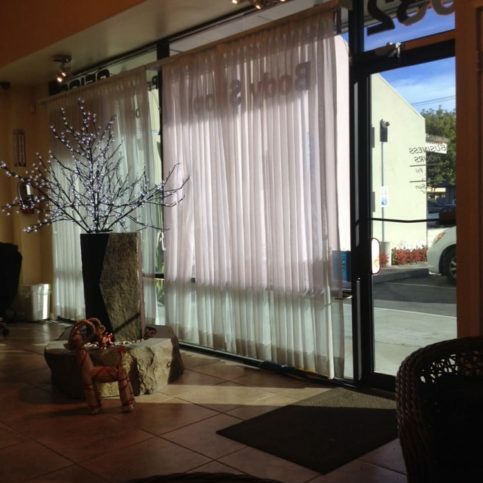 Why Trust Diamond Certified Auto Body Shops in Alameda County Rated Highest in Quality and Helpful Expertise®? Only the best auto body shops have earned the Diamond Certified award by scoring Highest in Quality and Helpful Expertise® in the most accurate and rigorous ratings process anywhere. So, you’ll never be fooled by fake reviews, since all research is performed by live telephone interviews that authenticate only real customers are surveyed. Most companies can’t pass the test. Thousands of local auto collision center customers have been interviewed in live telephone calls, and only the auto body shops that scored Highest in Quality and Helpful Expertise®, a 90+ on a 100 scale, as well as pass all of the credential-based ratings earn Diamond Certified. By requiring such a high score to qualify, the Diamond Certified Resource cuts out mediocre and poorly-performing companies. If you want quality, you’ll have confidence in choosing Diamond Certified companies. And you’re backed by the Diamond Certified Performance Guarantee, so you’ll feel secure in your decision. Whether your car accident was your fault or not, you have the right to choose which auto body repair shop will repair your vehicle after an auto crash. Sure, your insurance company may recommend repair shops. But the final decision is always yours. Most insurance companies have agreements, known as direct repair programs (DRP), with collision repair facilities in Alameda County. While this might seem like a convenient alternative to researching and choosing a shop on your own, this is one area of auto collision repairs where information is key. Why? Insurance companies often enforce strict limits on repairs done at DRP shops. This can cause them to cut corners, including in the quality of the replacement parts and the time the shop spends on your repairs. If you’re not careful, you can end up getting an inferior repair job even though you’ve followed your insurance company’s advice. Remember, it’s vital you choose a qualified automotive body repair shop for collision repairs for your mini-van, car or truck. This avoids conflict and can preserve the resale value of your vehicle. Incorrect body damage repairs are often not reversible, devaluing your vehicle and compromising your safety. Keep in mind that car insurance companies rarely pay for the same repairs twice. So even if another shop can repair the damage done by another auto body repair center, you’ll probably have to pay for the additional body repairs out-of-pocket. After a car crash, you’re probably in a hurry to have your collision damage repaired at one of the auto body shops that serve major cities like Oakland, San Leandro, Berkeley, Hayward, and Fremont—and all the smaller towns in the Tri-Valley. However, it’s in your best interest to take your time and research a few local auto body shops to find the one that will best serve your needs and repair your car or truck correctly the first time. While it’s usually best to choose a Diamond Certified company because of their Highest in Quality and Helpful Expertise rating, that may not always be possible. If you’re unable to choose a Diamond Certified company, you can improve your chances of finding a decent auto body shop by checking out local shops on the California Bureau of Auto Repair website. 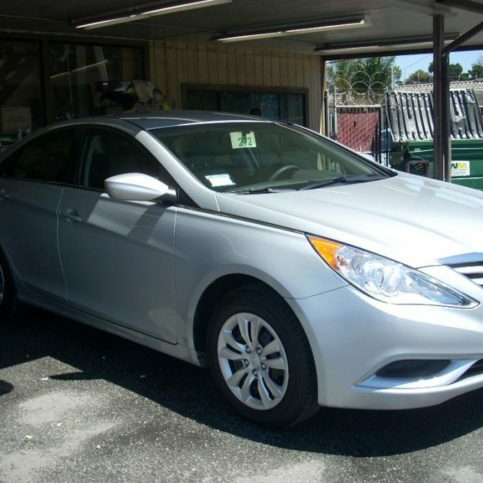 You’ll find a list of car body shops that are licensed and in good standing with the state. And while this website doesn’t contain any customer satisfaction research, you will be able to see any complaints that have been filed with the state or if the auto body shop’s license has been revoked. Body shops with certified vehicle collision repair technicians on staff tend to have more training and up-to-date knowledge of the newest car body repair methods. There are even Green auto body shops in Alameda County. These shops have completed courses and earned certifications in environmentally responsible collision repair and auto painting services. If credentials like these are important to you, ask the auto body shops for a list of industry recognition and qualifications they’ve earned. 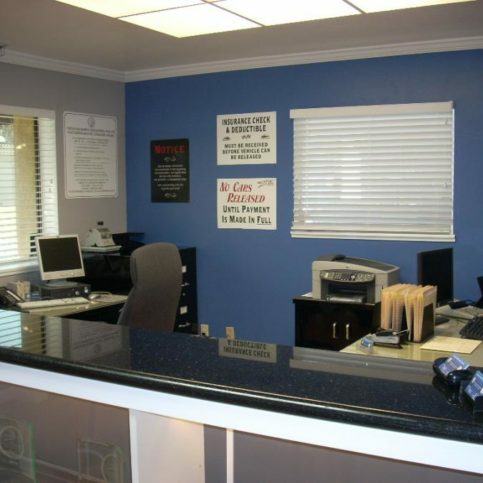 Many local auto body shops will offer to handle insurance paperwork for you if they’re repairing your vehicle. This can be a priceless timesaver, so ask the auto body shops you’re considering if they have experience working with insurance companies. Another factor to consider when researching good car paint and body repair shops is the quality of replacement parts each shop uses. Just as it’s your right to choose which body repair shop to hire for collision repairs, you’re frequently entitled to choose the replacement parts that are used. OEM (Original Equipment Manufacturer) parts are manufactured to fix your car exactly and may last longer than aftermarket auto body parts. Salvaged or refurbished parts often come with no warranties since their safety and expected wear cannot be guaranteed. If you did not cause the accident that totaled your car, immediately tell the auto body shops that you want OEM parts installed. If the accident was your fault, ask about your specific case. There may be wording in your insurance agreement that mandates the use of aftermarket parts, refurbished (repaired) auto parts and salvage auto body parts. However, it may be worth paying the slight difference between aftermarket parts and OEM parts to get better quality auto body parts installed. If you live in the Tri-Valley or in the smaller cities of Albany, Ashland, Castro Valley, Emeryville or Komandorski Village, your insurance company may ask you to bring your wrecked car, truck or minivan into a local auto body collision shop for an auto body repair estimate. Luckily, because of their ability to tow in wrecked or totaled vehicles, car body shops in larger cities may be able to provide auto body repairs rather than leaving you stranded. 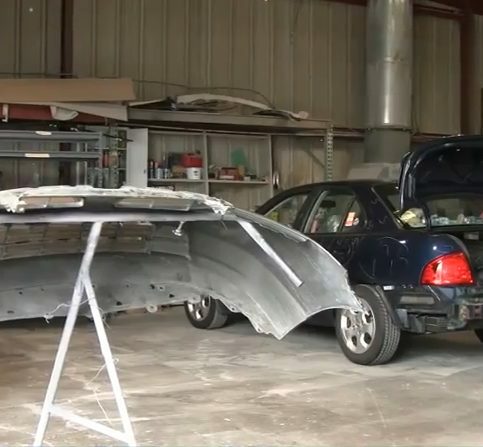 For example, auto body repair shops in the Oakland area can also serve the smaller cities of Mount Eden, Piedmont, Russell City, San Lorenzo and Sunol. Why Trust Diamond Certified Auto Body Shops Rated Highest in Quality and Helpful Expertise®? 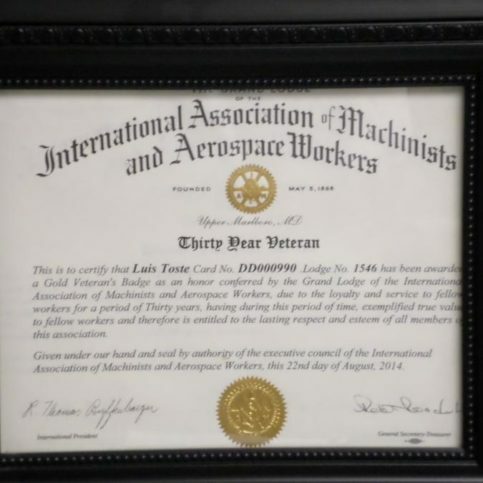 Manuel Garcia is a lifetime veteran of the automotive industry and owner of George McGill’s Body Shop, Inc., a Diamond Certified company since 2011. He can be reached at (510) 224-5918 or by email. A: S.L. Benfica, Portugal’s premiere football [soccer] team. Here in the U.S., I like the Golden State Warriors. A: A ’74 Ford Pinto station wagon. A: Thanksgiving—the whole family gets together, but it’s not a commercial holiday like Christmas. Snehal Shah is a 14-year veteran of the automotive industry and owner of Auto Techies, a Diamond Certified company since 2011. He can be reached at (510) 397-8966 or by email. Born in India, Snehal came to the United States at an early age and was raised in Southern California before making his way to the Bay Area. Today, as a resident of San Ramon, he says he appreciates the comparative lack of traffic. “In Southern California, there’s traffic pretty much 20 hours a day due to the constant growth and freeway construction. We have our share of traffic here, but overall, it’s a lot easier to get around.” While Snehal says his business accounts for the bulk of his schedule, when he’s able to get away, he enjoys spending time with his wife, Bhavna, and their son, Abinash, who is currently attending college. A: Summer—I enjoy the long days and cool evenings. A: The 4th of July, because of the outdoor activities like barbequing and watching fireworks. A: A 1970 Buick LeSabre, which was a family hand-me-down. A: Any kind of Ferrari. Q: Who’s the best James Bond? Auto Techies’ technicians undergo continuing industry education. George McGill’s displays more of its prestigious affiliations. 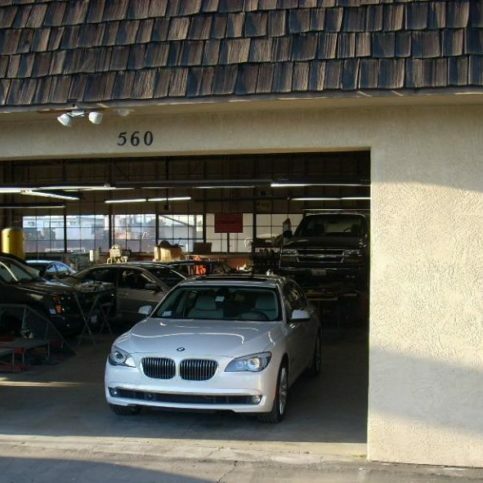 Coelho’s Body Repair & Auto Sales is family-owned and operated. 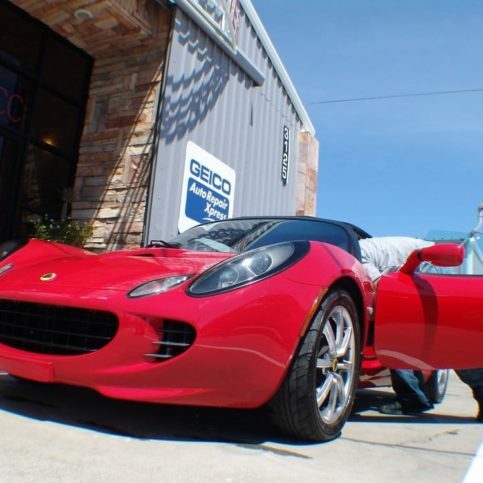 The shopÛªs services include collision repair and suspension work. The company aims to restore vehicles to their pre-accident conditions. 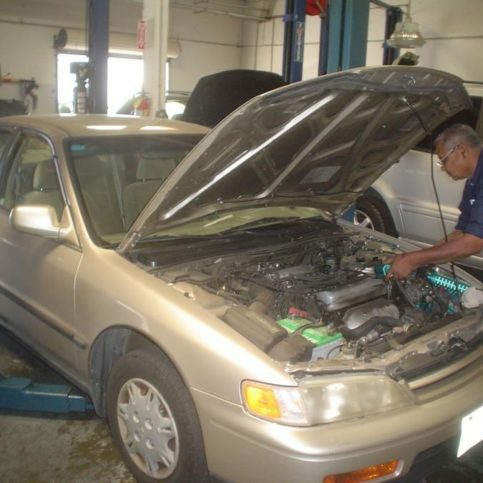 Auto Techies handles factory-specific maintenance and repairs. Owner Snehal Shah performs an electrical system diagnosis on a customer’s vehicle. 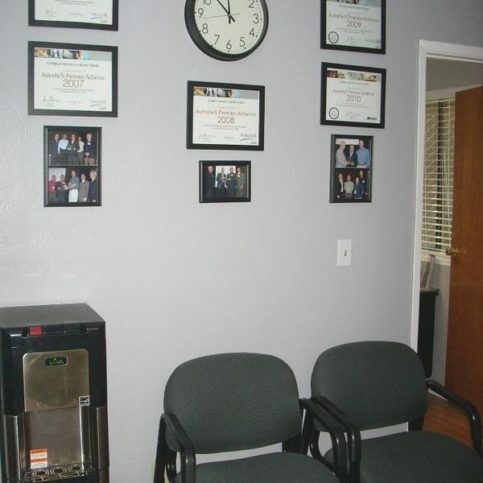 The Hayward location waiting room offers comfortable seating and a flat-screen TV. George McGill’s is a six-time AutocheX Premier Achiever. 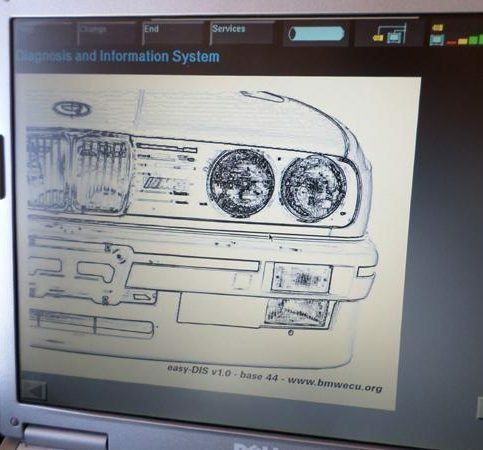 Auto Techies possesses an array of computer diagnostic tools. 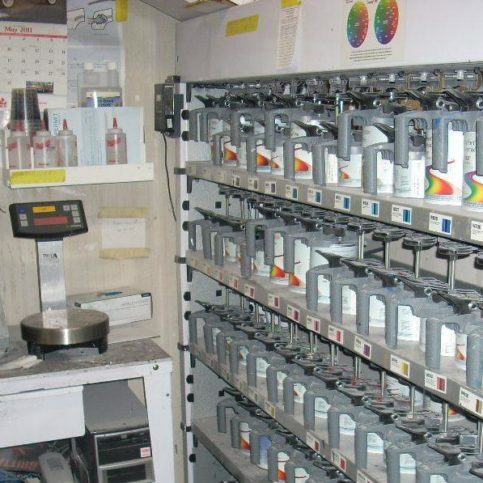 George McGill’s uses Dupont’s computerized paint matching system. 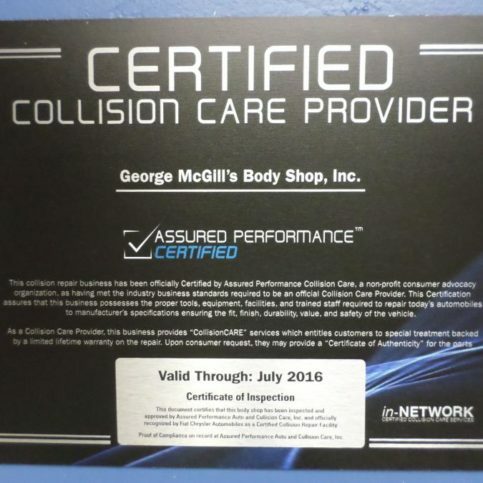 George McGill’s Body Shop proudly displays its Diamond Certified status. 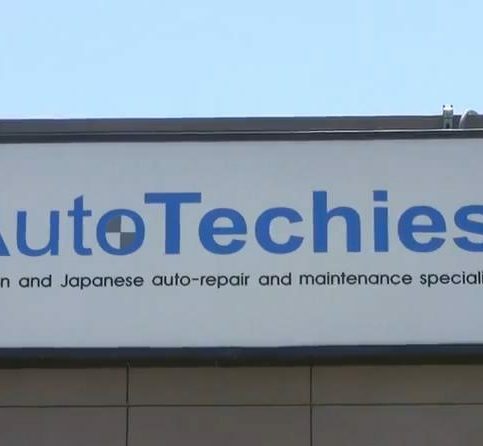 Auto Techies is located at 41443 Albrae Street in Fremont. CoelhoÛªs can also assist customers with insurance claims. 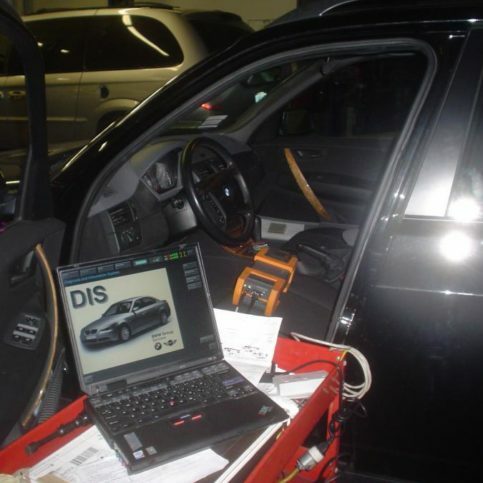 Auto Techies performs dealership-quality work for a fraction of the cost. 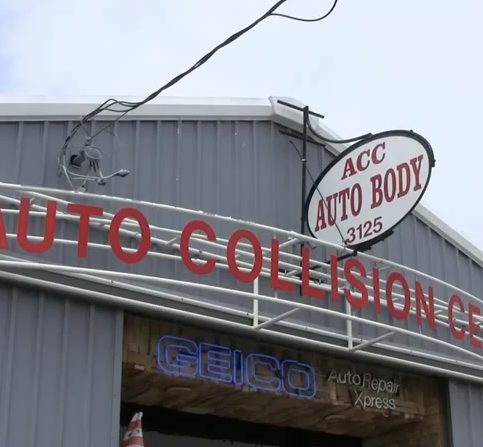 Automobile Collision Center is a direct repair shop for several insurance companies, including Geico. 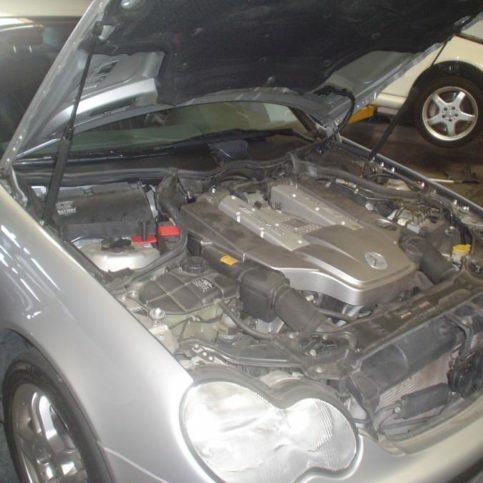 Auto Techies specializes in German and Japanese vehicle makes. 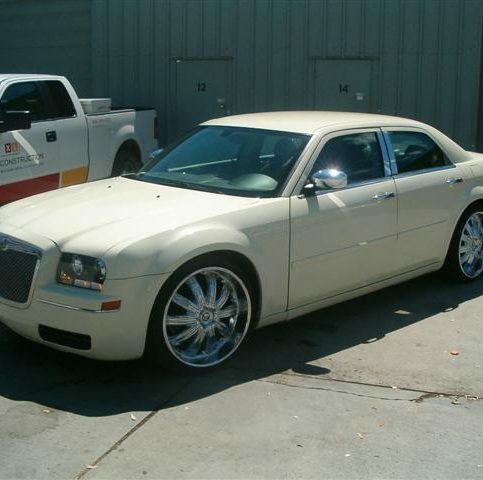 CoelhoÛªs Body Repair & Auto Sales, Inc. serves all of Alameda County. A George McGill’s Body Shop technician spray paints a customer’s vehicle. 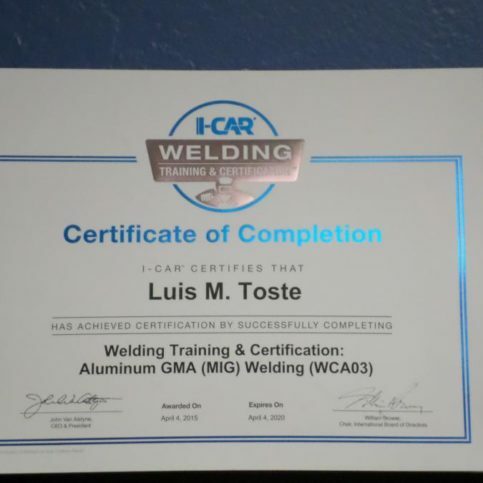 All of ACC’s technicians are I-Car and ASE-certified. Owner Snehal Shah’s engineering background augments his understanding of the sophisticated electronics in today’s cars. 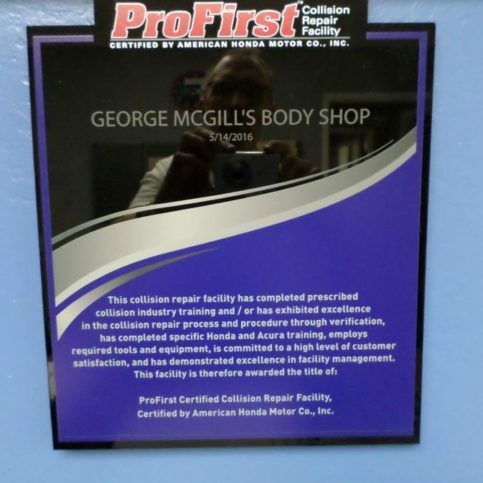 George McGill’s Body Shop is a part of AAA’s Direct Repair Network. 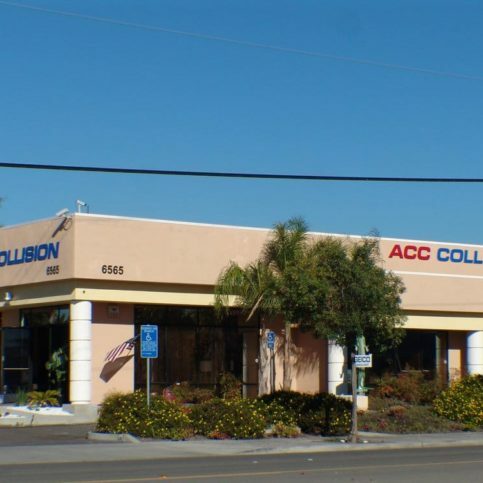 Automobile Collision center backs all of its work with a lifetime warranty. These industry associations and consumer agencies may have additional information you can use. What is my overall goal in getting my car, truck or minivan repaired (major collision damage, fender-bender repair or new auto paint to cover scratches and auto body dings)? What is my budget for the vehicle body repairs? Will my auto insurance cover any or all of the body work? How long will the car collision repairs take? What contact information do you have for me and what do you need in order to reach me with updates about my car’s body repairs? 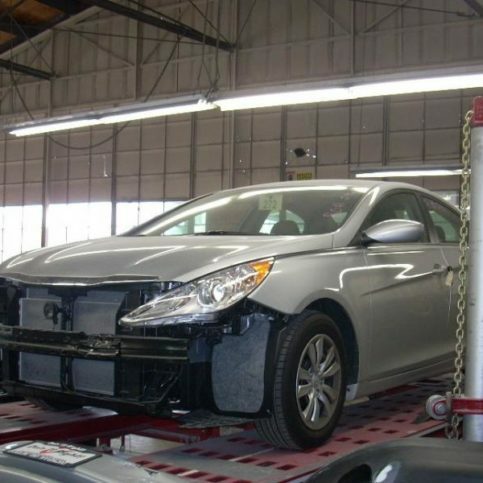 Do you coordinate with other Alameda County auto body shops if you can’t complete all of the collision repairs yourself? Does that affect any warranties? 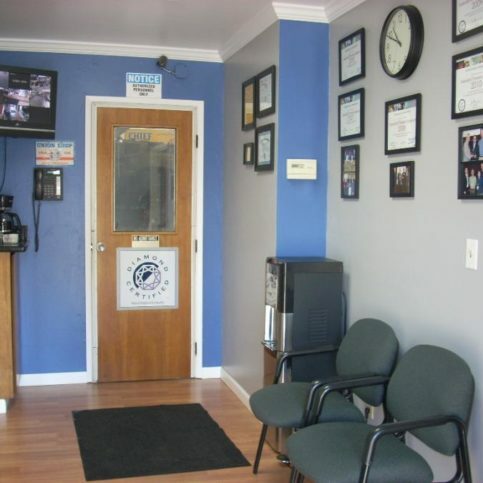 All Diamond Certified auto body collision shops have undergone a ratings process that most other companies can’t pass. If you want to hire a quality body shop, you’ll feel confident when choosing Diamond Certified companies. You can read Diamond Certified reports on all certified companies, including verbatim survey responses. And you’ll never be fooled by fake reviews because all the research is performed by live telephone interviews of a large, random sample of real customers. If you can’t find a Diamond Certified vehicle collision shop within reach, you’ll need to conduct some research of your own. If you do, shops should be willing to give you a list of recent customers you can call. Keep in mind, though, that references provided by car body repair shops are not equal in value to the large random sample of customers surveyed during the Diamond Certified ratings process. That’s because references are “cherry-picked,” not randomly selected from all customers, so those shops are likely just giving you a few satisfied customers to call. Were you satisfied with the performance of _(company name)_ auto body shop? What type of car body repairs or auto paint repairs did they do for you? Did they work with you to get the auto body repairs done exactly as you wanted them? Do you feel the price was fair for the auto collision repairs? If you live in a smaller town such as Castro Valley, Albany, Komandorski Village, Mount Eden or elsewhere in Tri-Valley, was your auto body shop willing to tow your car or truck to their collision repair garage? 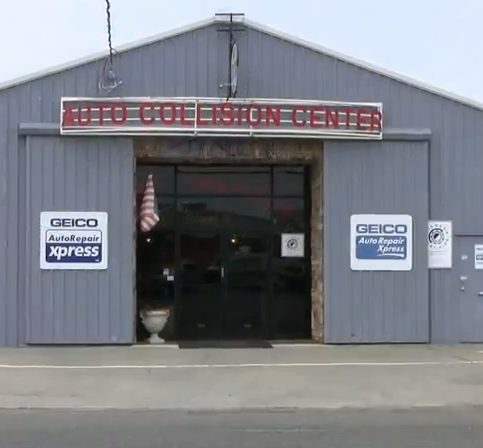 Were you happy with the communication from this Alameda County auto body shop? Did the auto body shop help you deal with your insurance company? Did they provide a loaner car or shuttle service while your car was being repaired? Would you go back to this company again if your car, truck or van were in a crash? By now you’re probably aware that the auto body repair shop you choose determines how smoothly the repair process will go and the quality and value of your vehicle after the repairs are completed. Since vehicles are often our second largest investment (after our homes), it’s not a decision to take lightly. 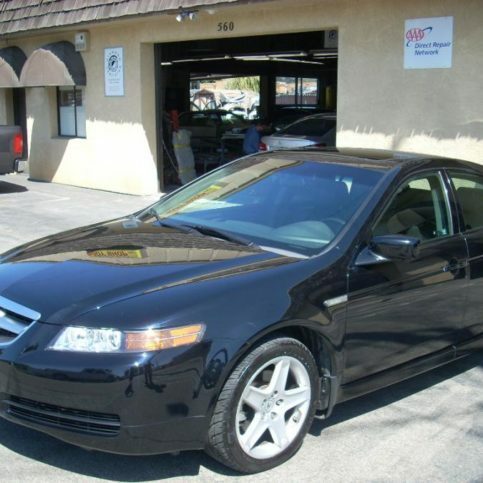 Is the auto body shop as devoted to getting your car back to pre-accident condition as you are? 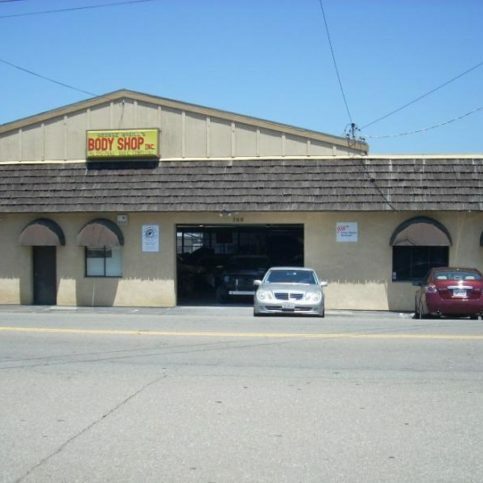 Can an auto body shop in Alameda County satisfy your requirements for scheduling, body repairs and part preferences? Does the service writer at the auto body shop communicate clearly and effectively? Is the shop you are selecting willing to work with your insurance company while still providing the best outcome? If the answers are yes, confidently move forward in setting up an appointment with the auto body shop. 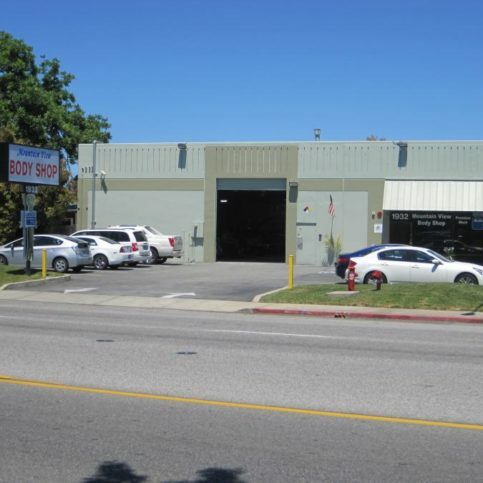 If you’ve found the Alameda County auto body shop that meets your needs, that’s great news! Here are a few things you can do to get accurate estimates and the quality service you expect. Meet with the shop’s service writer and discuss all necessary repairs. 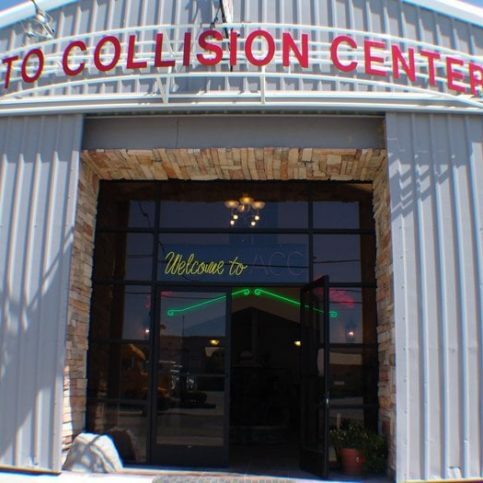 Remember: the goal of every good auto body shop is to fully repair collision damage. Your car should look and function as well as it did before the car accident. When you, your collision repair facility and your car insurance company agree on the car repairs that are necessary, the shop should provide you with a written estimate outlining the needed repairs before the work begins. By law, this estimate must include the total cost estimate for all car parts and labor, an itemized list of required parts, and whether the parts used are used or new. Confirm warranties at this time, as some shops only guarantee certain auto body paints or replacement parts. Your agreement with the body shop is final when you sign the estimate or work order. Never sign a blank or incomplete estimate. Keep in mind that the collision shop must get your approval before making any changes to the work orders and estimates. So be sure to give the auto body technicians a phone number where they can reach you at all times, such as a work or cell phone number. Return all their calls promptly to keep your repairs on schedule and ensure that you get your vehicle back on time. How Can You Be a Good Auto Body Shop Customer? It’s the auto body shop’s responsibility to perform a thorough and complete repair job on your car. But you play a big part in how successful of your automobile’s body repairs are, too. Here are a few simple steps you can take to be a good customer when you take your car, minivan, truck or van into a local auto body shop. Be clear and upfront with the auto body repair shop representative. Let them know what car problems you’re having, what outcome you expect from the vehicle collision repairs and specific ways they can satisfy those expectations. Before you drop off your car, truck or van, restate your expectations and goals, and reiterate to the auto body repair technicians your understanding of the agreement. Most problems with auto body shops occur because of a breakdown in communication. By being clear about your expectations, you can avoid most conflicts. Ask your service writer if you should call to check on the progress of your vehicle body repairs or if he will call you with regular updates. Be sure your service writer has the phone number where they can reach you at all times while your car or truck is in for vehicle body repairs. Your repairs will move along more smoothly if you can be reached for any necessary updates or authorizations for car body repair work. When the shop contacts you, return calls punctually to keep the repairs on schedule. Pay for the car body repairs promptly. Why would you want to be a good customer? 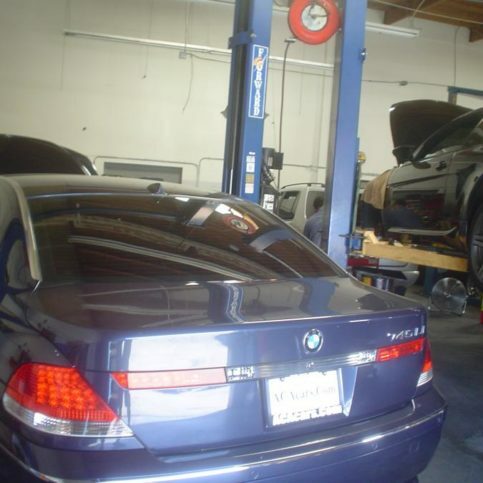 Auto body repair shops in Alameda County appreciate when customers are straightforward, honest and easy to work with. Your “good customer” behavior sets the tone from your end and creates an environment conducive to a good relationship. Therefore, the process may go smoother and any problems may be more easily resolved. The name and physical address of the collision repair shop and their registration number. A list of all auto body work performed. The total auto collision repair cost, including the amount due for labor. An itemized list of all replaced parts. 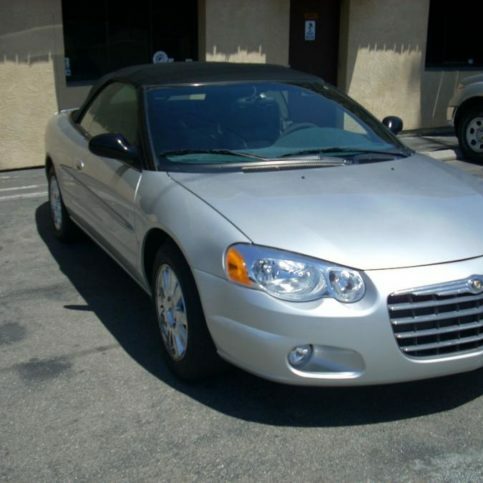 This list must state whether the parts were new, used, salvaged, reconditioned, or rebuilt. Any applicable hazardous waste disposal fees and the body shop’s Environmental Protection Agency (EPA) number. It’s smart to compare the written invoice to the work that was actually done. Ask the body repair specialist to show you each repairs, and check the completed work against the invoice. Your shop should be willing to talk you through the process and give you any special instructions for maintaining your collision repairs and new auto body paint. If you have questions about the work that was completed or how it was done, this is the time to ask. The shop’s name and physical location / address. What is covered by the warranties. This includes whether the shop will replace or repair the parts or give you a refund if there is a warranty claim. Any exclusions must written. Terms of and limitations on the car body repair warranties. Your responsibility if you need to redeem your warranty for vehicle body repairs (if you have to pay for labor, agree to used parts or pay a prorated amount). If auto body repair warranty coverage is transferable to a new owner if you sell your vehicle. Popular auto body repair requests are listed below. These services are available within the following Alameda County cities. Read the paragraphs below for the definition of each car body repair. Auto body repair refers to all repairs made to the exterior of vehicles, including dent repair, scratch repair, auto crash repair and fender bender repair. Car body damage can result from vehicle collisions, car accidents and acts of vandalism. 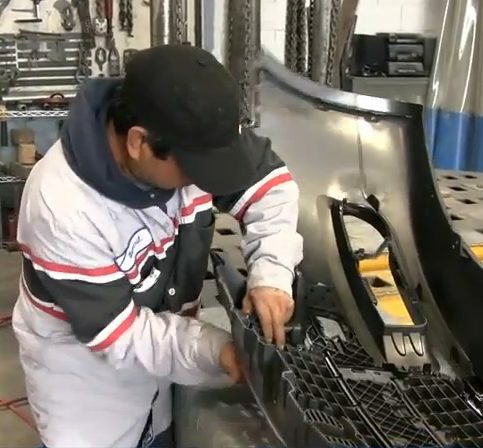 Alameda County auto body repair shops offer bumper repair and replacement, auto painting and scratch and dent repair for vehicles involved in collisions and auto crashes. Auto body shops provide automotive painting for collision damage repairs and to restore vehicles including cars, trucks, vans and minivans. 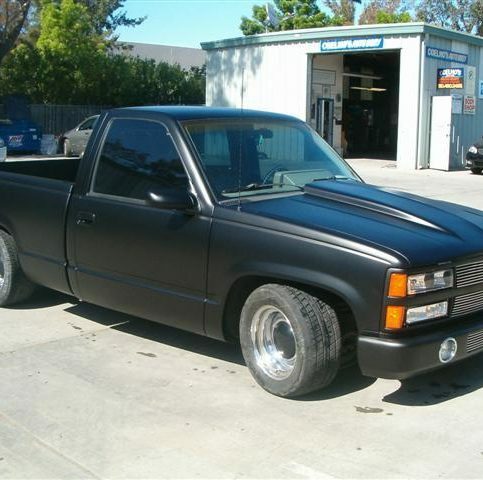 A new coat of paint can change the look of your vehicle. 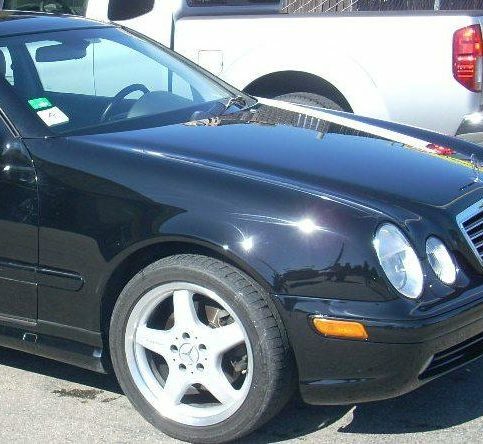 From car repainting services that give your vehicle a new color to automotive painting that covers damaged areas like dents, scratches, chips and auto paint dings, vehicle painting services can give you the look of a new car at a reasonable price. 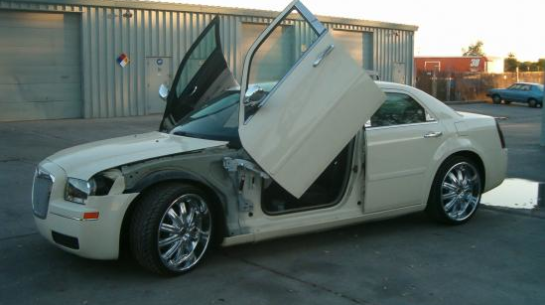 This type of auto body repair restores vehicles after collisions and auto crashes. Usually, auto collision repairs include frame straightening, auto body work and automotive painting to cover dents, scratches, dings and crumpled auto body exteriors. Whether from fender-benders or careless passersby, car dents can be a major annoyance. 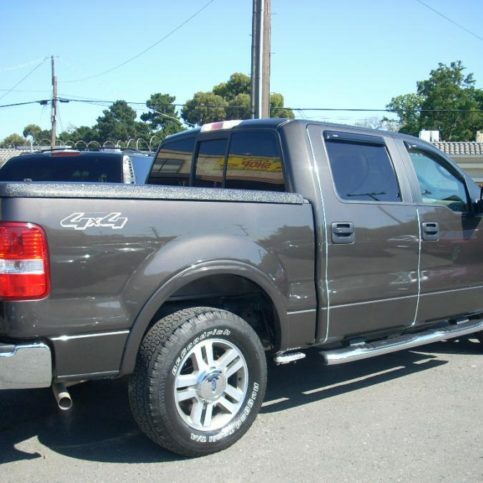 Alameda County auto body repair shops can pull dents to make your truck, van, car or minivan look like new. Automobile dent repair may require vehicle repainting depending on the severity of the damage. Automotive painting facilities offer auto paint chip and scratch repair, paint matching, vehicle paint touch-ups and spot painting. 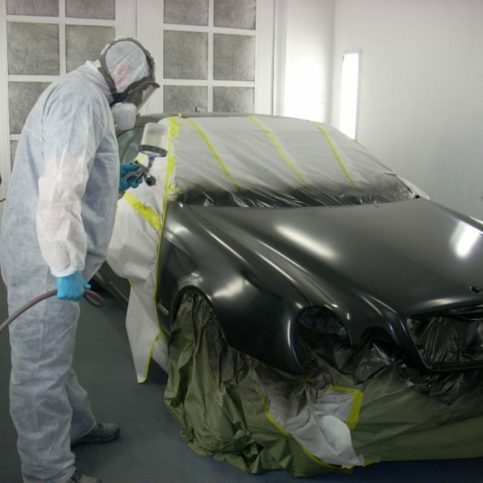 Auto paint repair is best used to cover minor auto paint scratches, flaking and chips. Major auto body damage from an auto wreck or car accident is best repaired by hiring a shop to do automotive paint restoration to larger areas of your truck, van or car rather than simple auto paint repairs. Bumper repair fixes bumper dents, bumper tears and scrapes from fender-benders and car accidents. 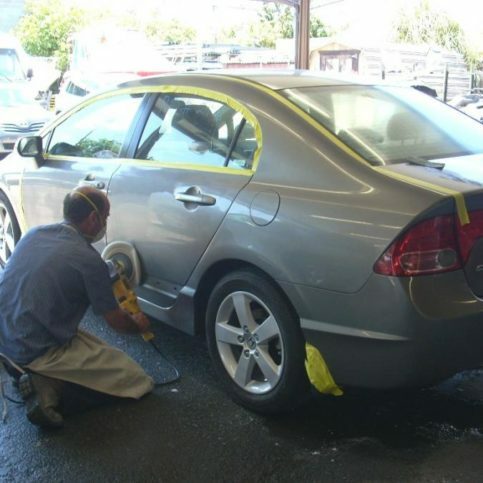 Bumper repair usually also includes dent removal and bumper repainting. Bumper replacement includes removing and replacing an entire bumper that’s been badly damaged in a car crash. Customization is available for new vehicles (usually with custom body kits) and vintage or classic vehicles (also known as auto body restoration). Custom auto body work may take the form of chop jobs (modifying the original frame or body of your car, truck or van) or customized auto paint that takes your vehicle beyond stock auto paint colors. Auto upholstery repairs are a popular way to improve the comfort and appearance of cars, minivans and trucks. Car upholstery repairs can also enhance their trade-in and resale value. Car body repair shops that offer auto upholstery repairs are usually knowledgeable about different battings and materials that change the comfort and appearance of your vehicle’s interior. More serious than minor dents, scratches or sideswipes, vehicle frames that bent in collisions and car accidents require straightening in order for the vehicle to drive correctly. Bent vehicle frames that are not straightened can cause uneven wear on the car or truck and make it more vulnerable in an accident. Only licensed auto body repair shops have the equipment and expertise to straighten vehicle frames after a collision or car accident. 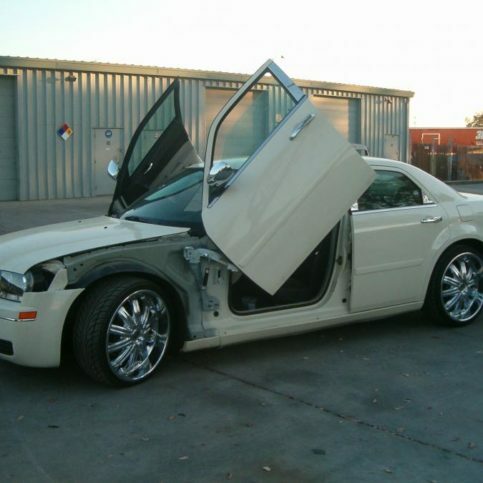 Mobile auto body and paint repair companies bring the auto body shop to you. 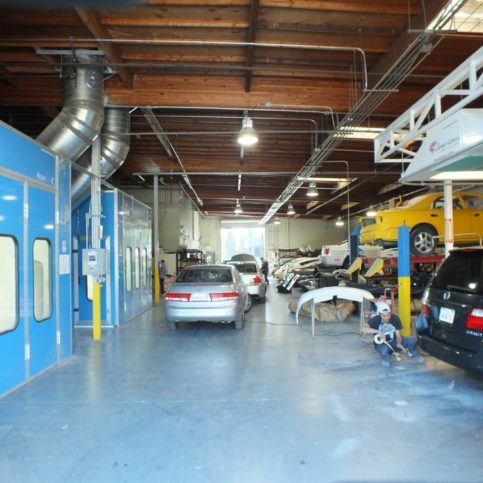 These body shops are at times more convenient than traditional auto collision centers. Mobile auto body repair shops provide minor auto body repairs, dent removal and auto paint repair services at your home or place of work. Some mobile body repair shops offer same-day service for your car, minivan, truck or van and will cooperate with your insurance company. Below are common auto body repair terms and descriptions that will help smooth your way through your auto’s repair from beginning to end. Auto body repair parts not made by the original manufacturer. Aftermarket auto body parts are made to fit and function the same as the original car parts, and they’re often less expensive than OEM (Original Equipment Manufacturer) auto body parts. 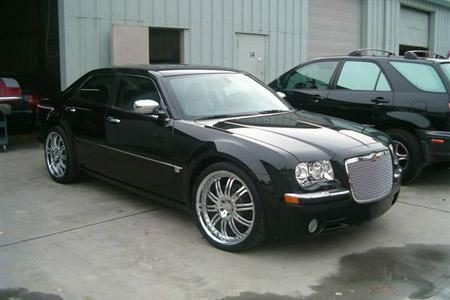 Some aftermarket auto body parts have been redesigned to increase the performance of your car, truck, van or minivan. Some auto parts stores sell wholesale auto body parts. These aftermarket auto body parts include car antennas, new vehicle bumpers, car mirrors, new car doors, auto fenders and fender flares, automotive grills, new car and truck hoods, hubcaps, replacement and new running boards, truck tailgates and truck tonneau covers. 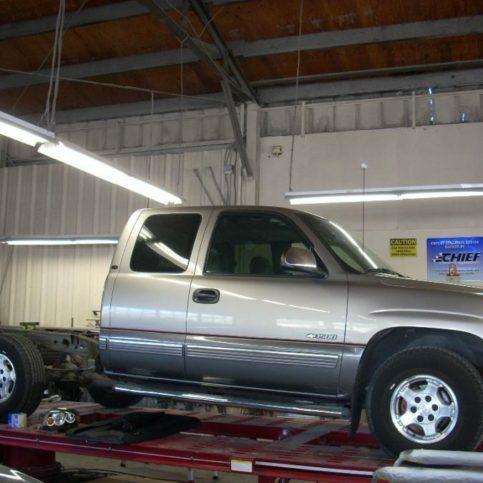 An automotive repair shop that specializes in repairing the body, or outside, of vehicles. Auto body repair shops restore vehicles damaged in automobile accidents and those that have sustained damage to their exteriors due to vandalism, weather and corrosion. Automotive paint process in which the basecoat is highly colored and shows through the durable and glossy clear coat. Popular manufacturers of automotive basecoat and clear auto paint include 3-M Automotive, Diamont Auto Paint, Duramix, EZ Mix Cups, GCI Alkyd Enamels and Matrix Auto Paint. Auto bumpers are among the most important safety features of your vehicle. Bumpers are located on the front and back of all cars, trucks and mini vans, and they are designed to absorb the shock of a collision or car accident. Some bumpers are designed with crumple zones that flex and bend during a collision to provide better car accident protection. Bumper repair and replacement are common because of the frequency of major and minor car accidents that cause damage to the front and rear bumpers. ChipGuard is a chip resistant, protective coating applied to cars, trucks, minivans and vans to avoid paint chipping. Chip Guard is normally applied to the lower panels at the front of vehicles and near the tires. This clear car paint protector keeps automotive defends against stones, bugs and road debris that can damage your automotive finish. 3M Automotive Chip Guard, SEM Chip Guard and StonGard are three of the most popular types of ChipGuard available. Auto paint is said to chip when stones and other debris cause the colored paint finish to break off in small pieces. Auto body paint shops can buff out and refill chipped areas with matching paint to make the damage invisible. Clear coat is the top layer of auto paint applied to add shine and protect the colored basecoat. A clear coat does not have pigment added to it, so the color of the auto paint basecoat shows through. PROFIX automotive paints, DuPont auto paint, PPG, ICI, BASF vehicle paints and Sherwin-Williams car paints are the more popular clear coat auto paint suppliers. Single layers of auto paint are referred to as a coat of paint. Corrosion happens to the bodies of metal vehicles when the metal is exposed to oxygen and water. Some corrosion appears as rust and causes visible degradation of metal surfaces. Auto paint helps curb corrosion and offers protection against water and oxygen. Auto body shops offer dent repair for trucks, vans, cars and minivans. Auto dent repair is a method of removing car dents by pushing or hammering them out from the underside of the vehicle. Vehicle dent repair is effective for large and small dents, and may or may not require the application of fresh auto paint depending on the severity of the dent and the condition of the paint surrounding it. Auto paint topcoats that contain pigment and gloss are referred to as direct gloss. Direct gloss auto paint doesn’t require an application of clearcoat, and it protects vehicle bodies from weathering and corrosion. DRP insurance programs are usually an agreement between auto body shops and auto insurance companies. These DRP repair shops agree to repair collision damage using a standardized set of rules and procedures including repair techniques, parts and materials used, warranty coverage and billing practices in exchange for the insurance company directing customers to their cooperating direct repair program body shops. New auto paint must undergo drying, where it hardens and becomes a protective coating on the vehicle. Air drying takes place when paint is applied and exposed to air at normal temperatures. Force drying and low-bake are the terms for the process of drying auto paint at low and medium temperatures. High-bake auto paint drying occurs when the air is heated to accelerate drying. Edge-to-edge repair is a complete auto body repair for trucks, cars, minivans and vans. This type of auto body repair requires the removal and replacement or restoration of an entire vehicle panel. This is the opposite of car body touch-up or spot repairs, which are possible for damaged auto body panels and auto paint when only a small area is damaged, chipping or removed. A clear or colored topcoat automobile paint that has a shiny finish is called enamel vehicle paint. Enamel auto paints are available in gloss or semi-gloss finishes. Popular brands of enamel auto paint include those by PPG, DuPont, Maxx 2K and DupliColor. Van, truck and car fenders are the auto body panels located on the sides of the vehicle in front of the doors. Vehicle fenders serve aesthetic and practical functions. Fender-benders are a common, yet minor auto accident that damages the fenders of vehicles as a result of a collision. Some modern cars and trucks are designed with fenders that are easily replaced because fender benders are so common. 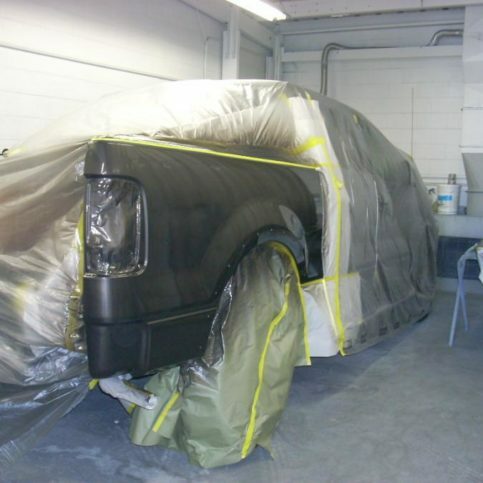 Finish coats are the last coats of auto paint layered onto vans, trucks and cars during auto body repairs. Gloss is the term used to describe how shiny or reflective vehicle paint is. Matte, semi-gloss and glossy are the common levels of reflectivity found in auto body gloss paints. Salvaged auto body parts removed from one vehicle and installed on another are often denoted as LKQ on estimates and invoices for auto body repairs. These car body parts rarely come with warranties and are often much less expensive than new auto body parts. LKQ auto parts may be the best option for owners of rare or specialty vehicles that have a hard time finding new auto body parts for their van, car or truck. Temporarily covering areas of vehicles that are not to be painted with plastic or tape. Masking should be done carefully to avoid overspray and uneven edges. 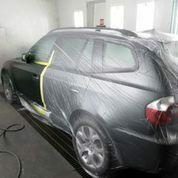 However, most auto body repair shops agree that masking is not a proper substitute for removing parts of the vehicle such as car mirrors and auto door handles that can create gaps in the paint application that cheapen and weaken a new auto paint job. Metallic auto paint is standard colored vehicle paint that has fine metallic particles mixed in to add shine and sparkle. DuPont car paints, Sherwin-Williams Automotive Finishes, Trinity 1945, 3M, Krylon and SEM Paints are some popular makers of metallic vehicle paints. Auto parts made by vehicle manufacturers including Ford, Chrysler, GM, Toyota, Honda and BMW. While they may cost more than aftermarket auto parts, OEM parts usually fit better, last longer and are covered by more extensive warranties. 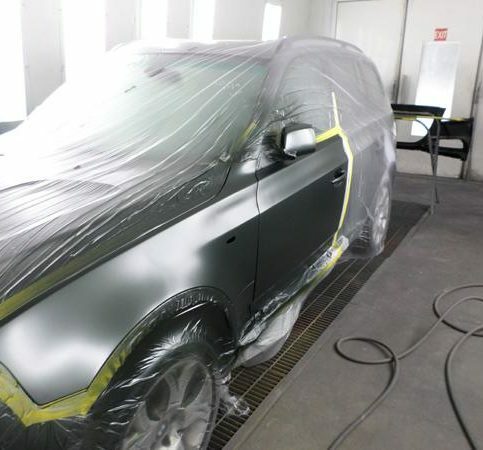 The first layer of an auto paint application is called primer. Auto primer is applied to an unpainted surface to protect the body of the vehicle and help the layers of vehicle paint adhere to the surface. Primer-sealer is the auto paint undercoat applied to seal underlying layers of paint and adhere the topcoat to the base. Auto body damage to minivans, trucks, cars and vans is often disguised by primer-filler. It’s a colored material that evenly fills scrapes and gashes and acts as a primer to attract and hold the topcoats of paint to the vehicle body. Primer-filler is most often used on bumpers, car doors and vehicle body panels that have been damaged in car accidents and fender-benders. Used to fill auto body damage such as gaps and holes, auto putty is a plastic material that can be sanded and painted over. Auto body repair putty is generally used to hide car crash and vehicle accident damage to bumpers, car doors, bumper trim and auto side panels. Auto body parts that are not damaged can be removed and installed back on the vehicle after the other collision repairs are completed. This is usually referred to on estimates and invoices as Remove & Install or R&I. 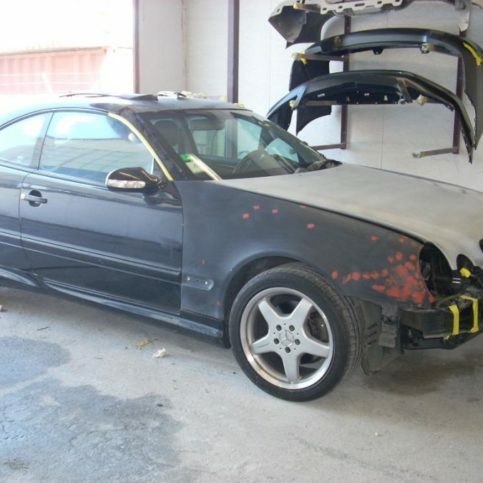 Auto body parts that are damaged beyond repair are itemized as Remove & Reface, or R&R. These car, truck, minivan and van parts are replaced with new body parts. Auto parts taken from recycled vehicles are called salvage auto parts. These are often inexpensive auto repair parts, but they usually don’t come with warranties because they haven’t been repaired or altered so their reliability can’t be guaranteed. Salvage auto parts for trucks, cars and minivans are often a last resort for vehicle owners looking for hard-to-find parts for rare or older vehicles. Commonly salvaged auto body parts include car and truck bumpers, vehicle doors, car body panels and car mirrors. Surface coatings on vehicles are often sanded using an abrasive process to provide better adhesion to topcoats of auto paint. The undercoat of auto body paint, which improves the adhesion of the topcoat and seals existing painted surfaces to prevent damage and corrosion. Spot repair is possible for damaged auto body panels and auto paint when only a small area is damaged, chipping or removed. Minivan, car and truck spot repair is generally much less expensive than edge-to-edge auto body repair, which requires the removal and replacement or restoration of an entire vehicle panel. This type of auto paint repair includes a basecoat, a colored middle coat and a clear topcoat. 3M, PPG, SEM, VHT, Krylon and Dupli-Color are popular makers of auto body paints used in three-coat auto body paint application on cars, trucks and mini-vans. The final layers of auto body paint. Topcoat often includes UV light absorbers that protect the auto body paint underneath from fading. A localized auto body paint repair that only covers a small area. Touch up paint jobs usually hide nicks, dings, chips and scratches that occur on car hoods, vehicle doors, bumpers and fenders. 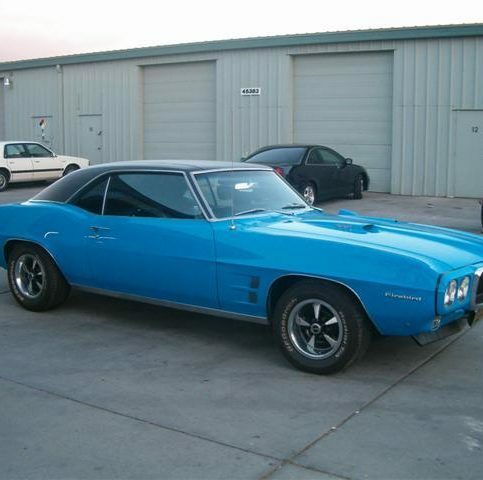 Auto parts that have been used and rebuilt, refurbished or reinstalled in another vehicle. Some of the most common used auto body parts installed on trucks, cars and mini vans include used car doors, vehicle hoods, auto bumpers, used trunk lids and vehicle hubcaps. See the following commonly asked questions about body repairs. 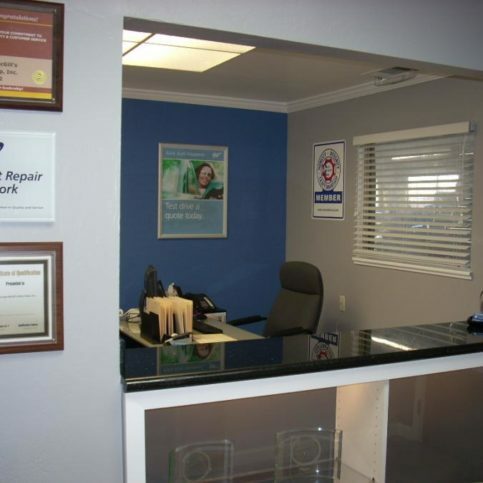 Q: Why choose a Diamond Certified Auto Body Repair Shop? A: At a time when you most need assurance of a job well done, Diamond Certified helps you choose an auto body repair shop with confidence by offering a list of top rated local companies that have passed the country’s most in-depth rating process. Only auto collision repair shops rated Highest in Quality and Helpful Expertise® earn the prestigious Diamond Certified award. Most companies can’t pass the ratings. American Ratings Corporation also monitors every Diamond Certified company with in-depth and ongoing research and ratings. And your purchase is backed by the Diamond Certified Performance Guarantee, so you’ll feel confident choosing a Diamond Certified auto body shop for your vehicle repair. Q: My insurance company gave me a list of auto body repair shops in Alameda County. Do I have to use their shops or do I have a choice of where to get my car’s body repaired? A: While your insurance company can suggest Alameda County auto body shops, you have the final decision on where you want to take your vehicle for collision repairs. Your obligation is simply to take your car, truck, van or minivan to the body repair center you prefer and contact your insurance company to let them know where your vehicle is. Q: I was in an accident. Do I have any say in what parts are used to repair my vehicle? A: Auto body shops have a variety of different quality materials and parts they can use to repair vehicles damaged in collisions. OEM (Original Equipment Manufacturer) parts are the most expensive body parts for the shop to use, so many automatically install used parts, refurbished parts or even salvaged parts to cut down costs. But you do have a choice. If you caused the accident, wording in your insurance coverage may require the body shop to install used, remanufactured or salvage auto body parts in your vehicle. However, you may have the option to pay the difference for OEM parts instead. Talk to your car body shop’s service writer and your insurance company about your specific situation. 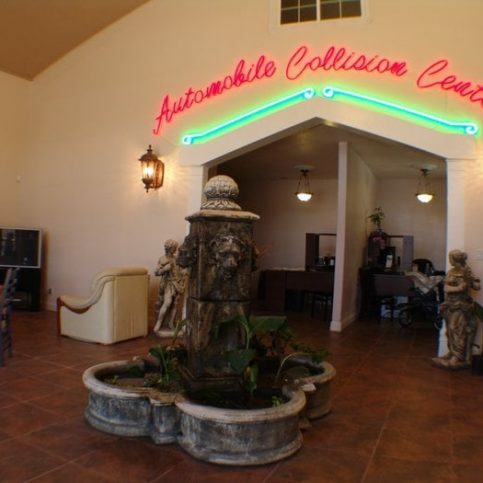 If the accident was not your fault, you can tell your chosen vehicle collision center what quality parts to install. 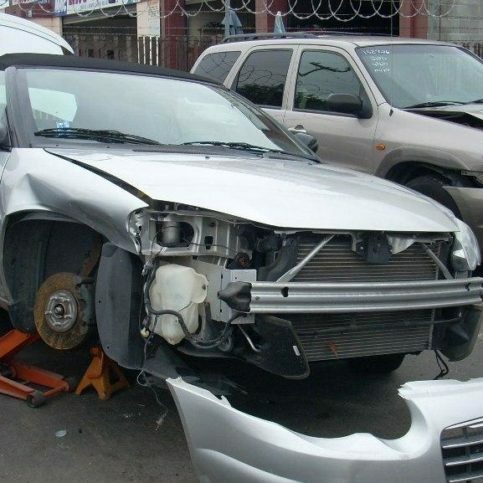 Ask for OEM auto body parts that will restore your vehicle to pre-accident condition in terms of safety and value. Q: Do I have to take my car to my insurance company’s claims center for an appraisal? A: Insurance companies can ask you to bring your vehicle in to their claims center before taking it to an auto body repair garage, but it is not a requirement. You may take it to them for an appraisal if you wish, but you are under no obligation and may leave your car, truck or minivan at your preferred auto body repair center and request that your insurance company inspect it at the shop. Q: Can my chosen auto body shop help me negotiate with my insurance company? 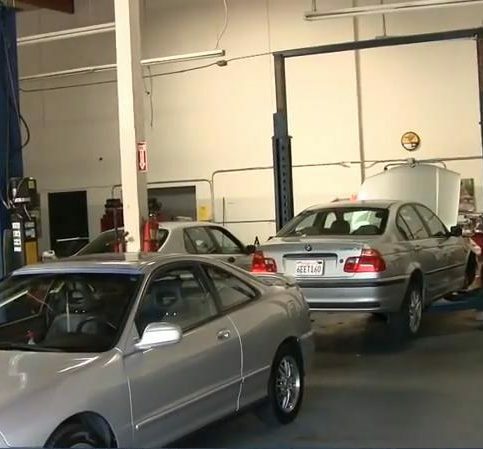 A: Most car body shops in Alameda County are happy to help you navigate confusing insurance claims paperwork. In fact, many will work directly with the insurance company to process your claims, limiting and even avoiding any work on your part. If this is important to you, ask the body shops you’re considering if they offer that service before you drop your vehicle off. Q: What is an auto body repair deductible? A: The deductible for auto body repair is a specified amount of money that you are obligated to pay before your insurance company will pay on your collision repair insurance claim. The deductible amount is determined by the terms of the policy that you and your agent decided on when you arranged to insure your car, van, minivan or truck. Q: Can auto body repair shops save me from having to pay all or part of my deductible? A: Honest auto body shops will not offer this. That’s because insurance holders have an obligation to pay their deductible before the insurance company pays the rest of the bill on every claim. This cuts down on insurance fraud. Some auto body repair shops do offer to bury the deductible or hide it in the cost of the repairs. However, car body repair shops that do this are committing insurance fraud, which is against the law. And customers who ask their auto body repair shop to hide the deductible or go along with this can also be held liable for insurance fraud. Even if your insurance company doesn’t catch you, asking your mechanic to bury the deductible in the cost of your auto body repairs is a mistake. Often times, auto body collision shops who agree to bury the deductible, will take shortcuts in your vehicle collision repairs, meaning your car or truck will lose value and may not be as safe in an accident. It also stands to reason that a collision center that cheats insurance companies may be willing to cheat customers as well. Q: What if my auto body shop performs the collision repairs incorrectly? 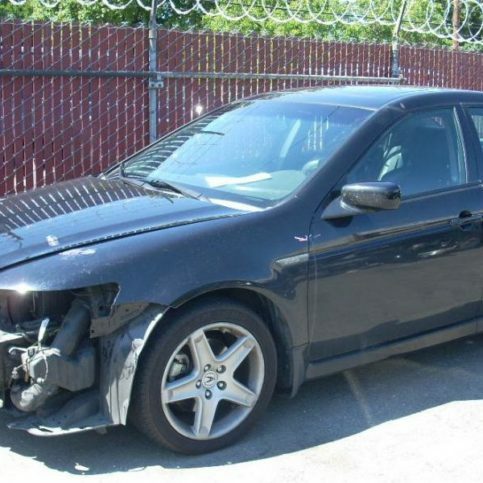 Can I get another auto body repair shop in Alameda County to fix the bad vehicle repairs? A: You should be very careful about who you hire to repair your auto body damage. That’s because once body collision repairs are done, they’re often very hard or impossible to reverse. That means that a body shop that does a poor repair job can actually end up causing your vehicle to be unsafe. It’s also important to note that insurance won’t pay for the same repairs twice, so even if you can find a repair shop in Alameda County willing and able to undo the shoddy auto body repairs, all costs will most likely come out of your pocket.